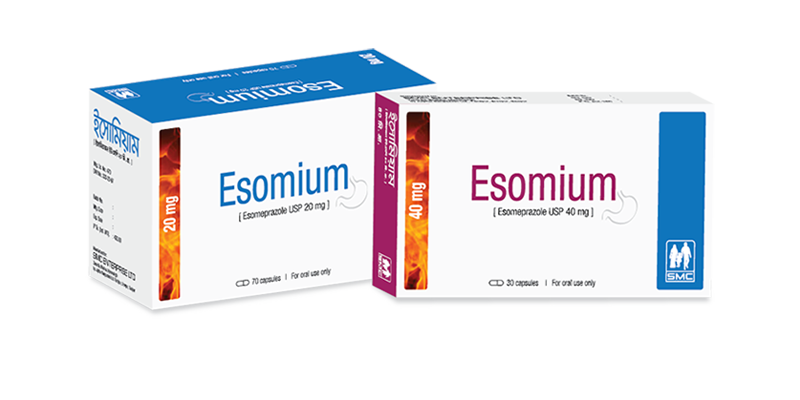 Esomium 20 capsule: Each capsule contains Esomeprazole Magnesium Trihydrate USP 22.27 mg equivalent to Esomeprazole 20 mg in enteric coated pellets. Esomium 40 capsule: Each capsule contains Esomeprazole Magnesium Trihydrate USP 44.54 mg equivalent to Esomeprazole 40 mg in enteric coated pellets. + + secretion by specific inhibition of the H /K -ATPase in the gastric parietal cell. By acting specifically on the proton pump, Esomeprazole reduces gastric acidity by blocking the final step in acid production. Headache, flatulence, nausea, abdominal pain, diarrhea, dry mouth, dizziness /vertigo and constipation. Pregnancy: Pregnancy category of Esomeprazole is C. This drug should be used during pregnancy only if clearly needed. Lactation: The excretion of Esomeprazole in breast milk has not been studied. A decision should be made whether to discontinue nursing or to discontinue the drug, taking into account the importance of the drug to the mother. Pediatric use: Safety and efficacy have been established for the short-term treatment of GERD in patients of 1-17 years of age. Symptomatic response to therapy with Esomeprazole does not preclude the presence of gastric malignancy. Esomeprazole inhibits gastric acid secretion. Therefore, Esomeprazole may interfere with the absorption of drugs where gastric pH is an important determinant of bioavailability (e.g.Ketoconazole, Iron salts and Digoxin). Esomium 20 capsule: Each box contains 7x10’s capsule in blister pack. Esomium 40 capsule: Each box contains 3x10’s capsule in blister pack.